Pre-election budget is about understanding the political economy and delivering a sharp messageFinance Minister AbulMaal Abdul Muhith apparently dipped into his party’s electoral playbook to design the Tk 4,64,573 crore national budget for FY2018-19. The 84-year-old minister who stood at the front row in Parliament on June 7 for a record 10th consecutive time also didn’t shy away from seeking another term for the ruling Awami League (AL) while presenting the proposed budget titled “Bangladesh on a Pathway to Prosperity”. With the national election scheduled at the year-end, the AL government’s lofty promises in the budget are largely targeted at a wide base of lower and lower middle class voters while milking resources from the urban middle and upper class to meet its political ends. 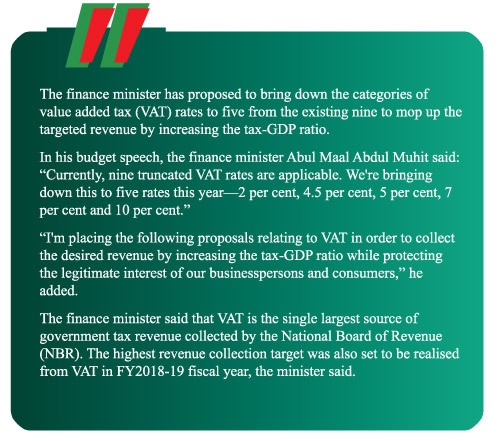 A loosened grip on the VAT regime and the reduction of nine truncated VAT rates down to five rates is an indicator of the government’s intention of giving a respite to the consumer class, but a status quo in slabs of the tax-free income comes as a surprise as pre-election discussions had hinted a change there. Explaining, Muhith said at Parliament: “Expanding the tax exemption threshold puts a significant number of taxpayers out of the tax net.” He also said that the tax exemption threshold in Bangladesh is almost 200 per cent of per capita GDP, whereas it is generally less than 25 per cent of per capita GDP in developed countries. 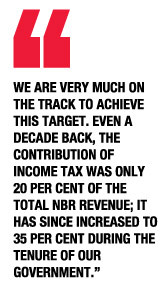 Muhith’s reluctance in broadening the tax-free income net is understandable, as, for a budget of Tk. 4,64,573 crore—the largest in the country’s history and 16 per cent larger than the last one—the government needs to rely heavily on income tax and other duties to fulfil its revenue collection target. The government has set a revenue collection target of Tk. 339,280 crore, out of which Tk. 296,201 crore is planned to be collected in different forms of taxes and duties. 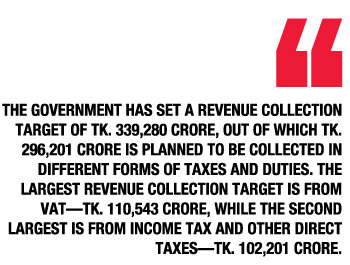 The largest revenue collection target is from VAT—Tk. 110,543 crore, while the second largest is from income tax and other direct taxes—Tk. 102,201 crore. In the outgoing fiscal year, these numbers were respectively Tk. 83,702 crore and Tk. 78,000 crore. So, this year’s targeted number indicates a staggering 32 per cent and 31 per cent targeted growth, respectively. With crowd-pleasing VAT measures and slow growth in income tax providers, sourcing such revenue would not be a cakework for the government. He also said that since 2011, the number of taxpayers has tripled and the number of return filers has increased from nine lakh to almost 16 lakh. “Observing this positive trend in tax compliance, I’m setting the target to increase the number of registered taxpayers to one crore and the number of return filers to 80 lakh within the next five years,” he added. Where the money will come from? The budget deficit this year will be Tk.125,293 crore, which is 4.9 per cent of GDP, up from 4.76 per cent of FY18. Of this, an amount of Tk. 54,067 crore (2.1 per cent of GDP) will be financed from external sources, while Tk. 71,226 crore (2.8 per cent of GDP) will be financed from domestic sources. Muhith said, elaborating on the domestic sources, that Tk. 42,029 crore (1.7 per cent of GDP) will be borrowed from the banking system, while Tk. 29,197 crore (1.2 per cent of GDP) will be borrowed from national savings schemes and other non-banking sources. With a prevailing absence of accountability and growth of non-performing loans, the banking sector is still suffering. Also, it has not recovered from a sudden and unwanted liquidity crisis and relatively lower lending growth rate, he observed. So borrowing such a large amount from the bank will be tough. The government probably would take more money from the saving certificate as it did in the last fiscal year. Muhith, too, acknowledged this in his speech. 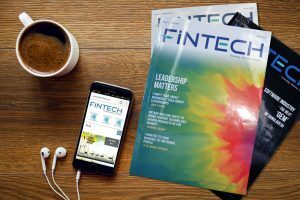 He said that in recent times, imbalance of liquidity in money market, together with problems with the management of a few banks, created worries. “The situation is now under control due to the timely steps we have taken,” he added. According to the finance minister, by the end of April 2018, the growth of broad money and domestic credit stood at 9.1 and 14.4 per cent, respectively, which are very much within the targets set out in the monetary policy statement of Bangladesh Bank. 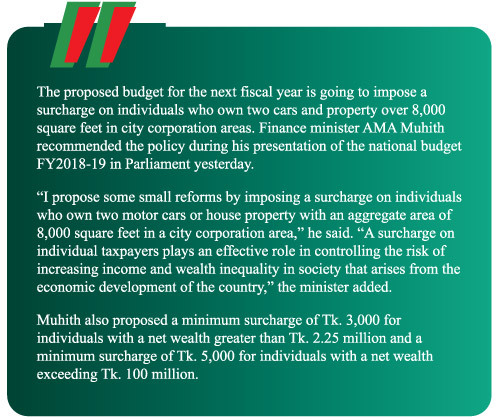 Muhith, however, proposed to reduce the tax rate for banks and financial institutions by 2.5 per cent. “This will give a positive signal to our investors,” he said. Why a tax cut for banks? Interestingly, the government seems to continue treating banks with kid gloves instead of going tough on them for the rampant financial irregularities and continued poor judgement. The latest in the line of mercies came in the budget in the form of a slash in corporate tax for banks and financial institutions by 2.5 percent in the incoming year. In fiscal 2018-19, the corporate tax rate for non-publicly traded banks, insurance and financial institutions would be 40 percent and for publicly traded ones 37.5 percent.Themove will cost the government about Tk 1,000 crore in lost revenues, said a high official in the National Board of Revenue. The corporate tax rates for the other sectors have been kept unchanged by Finance Minister AMA Muhith.The reason for the special treatment for the financial sector is that its corporate tax rates are higher than the other sectors, Muhith said in his budget speech. The economic rationale underlying the corporate income tax rate cut for banks while leaving all other rates unchanged is not at all clear.The whole idea behind corporate tax cuts is to make the investment climate in Bangladesh globally competitive, but this latest round of cut will not move the needle. The rate of corporate tax in Bangladesh is higher than the Asian average of 21 percent and the global average of 24 percent, according to KPMG, a global network of professional firms providing audit, tax and advisory services. Bangladesh’s tax rates for companies are also higher than that of Vietnam, Thailand, Malaysia, China, Indonesia, Sri Lanka and Pakistan. Vietnam and Thailand charge 20 percent tax for companies. It is 24 percent in Malaysia and 25 percent in Indonesia. A rate cut to a sector that is already saturated and looks unlikely to attract foreign direct investment seems ill thought-out. A 7.8 percent growth target, realistic? For FY19, Muhith has set an overall growth target of 7.8 per cent for the economy. In the outgoing fiscal year, the growth target was 7.4 per cent. The finance minister reported that according to final estimates of the Bangladesh Bureau of Statistics (BBS), growth stood at 7.65 per cent. This growth however wouldn’t yield desired benefit unless the government ensures a sustainable growth rate in employment as well. According to him, the 7 per cent GDP growth could not lift the income of the workforce. Rather the average real monthly income has eroded by 2.50 per cent in the ongoing fiscal year, despite the increase in employment, he noted. The fact is decent job creation is now more important than achieving GDP growth at a higher rate. Currently, jobs are mostly being created in the informal sector, where wages are very low. The outgoing fiscal year has not seen any significantly large investment from private players. In the proposed budget, there is no mentioning of any innovative measures to rope in a large number of new investors. So, it will be hard to attain the 7.8 per cent growth. On the expenditure side, the non-development expenditure in the budget for FY19, amounting to Tk. 295,200 crore, has eaten up about 62 per cent of the Tk. 464,573 crore total expenditure, out of which Tk. 66,224 crore will be spent on government salaries and allowances. Another Tk. 51,335 crore will be spent on interest on government loans. The size of the Annual Development Programme (ADP) will be Tk. 173,000 crore, Muhith said. Of the total ADP allocation, the finance minister proposed to allocate 26.9 per cent for human resources development (education, health and others), 21.8 per cent for overall agriculture (agriculture, rural development and rural institutions, water resources and others), 14.3 per cent for power and energy, 26.3 per cent for communication (roads, railways, bridges and others), and 10.8 per cent for other sectors. The government has allocated Tk 32,555 crore for mega projects under the next fiscal year’s ADP to speed up the implementation of the projects ahead of the next national polls.Eight of the nine projects had got an allocation of Tk 30,929 crore in the budget for fiscal year 2017-18. Most of the projects were a good few years behind schedule, including the flagship Padma Bridge project.The government had originally planned to inaugurate the Padma Bridge by the end of this year, but as of April, only 53.6 percent of the project had been completed. Dr Mirza Azizul Islam, adviser to a past caretaker government said the governments in Bangladesh have a tendency to include more projects than they could implement in the ADP. “They also take a long time in implementing those projects,” he noted. 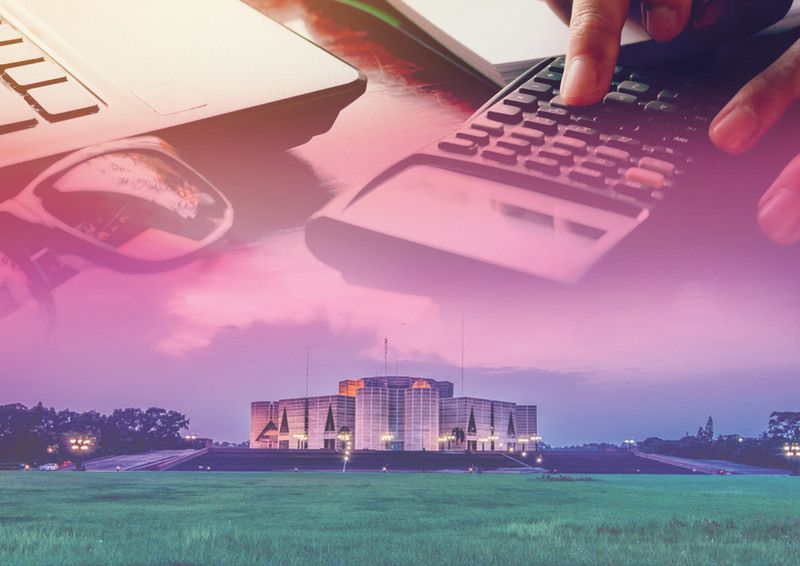 In this highly competitive world, the “real cost” of any project increases with each delay, so the budgetary allocation for it also exceeds “almost certainly”, putting a bigger dent in the exchequer, said Mirza Azizul.